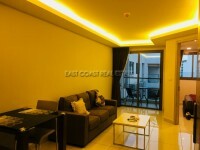 Holiday Condo View located just 250 meters from the beach. This building has just 5 floors and easy access to the beach. In this area you have got everything what you need like Family Mart, Shops, Restaurants, Laundry, Massage. The advertised price is for 1 year+ contract. For a shorter rental the price might be slightly higher. Available for sale at 2,500,000 Baht. Tax & Transfer will be split 50/50.